Nikon’s new COOLSHOT 20i GII golf laser rangefinder provides incredibly fast, accurate distance measurements for every shot—even those involving slope (elevation changes). 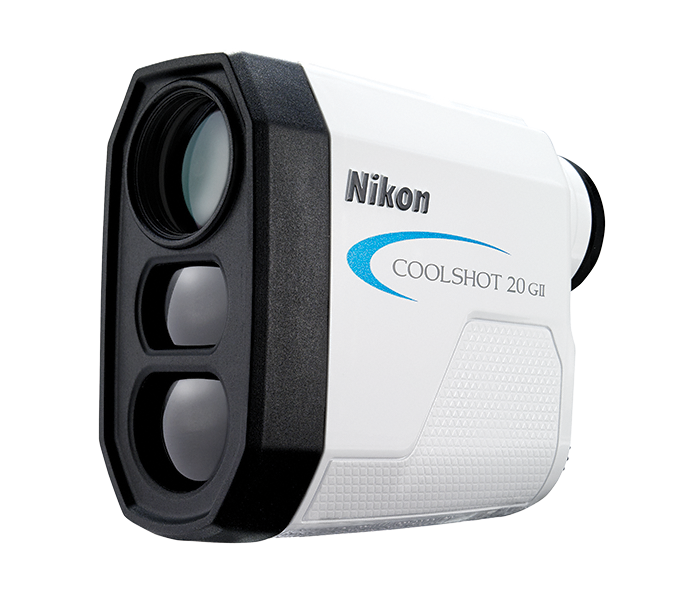 Featuring Nikon’s ID Technology for stress-free club selection when facing a shot with elevation change, COOLSHOT 20i GII eliminates second-guessing on how far uphill or downhill a shot will play. With so many unforgiving elements on a golf course, don’t let elevation change be one of them. Now with a 5-year warranty. First Target Priority displays the range to the nearest target among the multiple results obtained. This assures that the measurement shown is the pin and not any objects in the background. For 8-second continuous measurement, press and hold down the Power button to activate the continuous measurement function. The rangefinder will continuously measure the range for approximately eight seconds. This is useful when trying to find measurements of multiple or very small or thin objects, allowing you to know the distance to hazards, pins, mounds, and trees in one push and hold of the button. With this feature, you have the ability to scan across the green to easily pick out a flagstick from the background. Featuring renowned Nikon glass & multicoating technology, for clear, high contrast views, COOLSHOT 20i GII’s 6-power monocular has eyeglass-friendly long eye relief and adjustable diopter for tack-sharp focusing. If any Nikon rangefinder is found to have defects in workmanship or materials, we will, at our option, repair or replace it at no charge for a period of 5 years from date of purchase. Please see warranty card for limitations and exclusions.